In the late autumn of 2003 I had an opportunity to visit one of the shamans who used to be termed as "itako/itakko" in the Tohoku, i.e. the northernmost region of Honshu Island. It is rather well-known that they assemble, twice a year in spring and autumn, at the sanctuary of Osorezan located on the Shimokita Peninsula, Aomori Prefecture, where they perform ceremonies to call the souls of deceased people down to this world according to the requests of clients who visit for that purpose. This is to say that itakos are spiritual media who are capable of intermediating dialogues between the living and the dead. As a cultural anthropologist specializing in Siberian ethnology I have been interested in shamanism, since Siberia is deemed as its homeland. Siberian shamans, however, were brutally "liquidated" by the Soviet authorities in the 1930s. Consequently, during the Perestroika era when foreign researchers came to be permitted to conduct fieldwork in Siberia, living shamans were witnessed only in the republic of Sakha (Yakutiia). Accordingly, my shamanism study has been forced to focus chiefly on theoretical problems based on written documents. I have never seen any living shamans, except for my sporadic encounters with Yakut shamans in the Sakha republic. Shamanism is divided into two types: "ecstasy" and "possession." With regard to the former type, the shaman's spirit quits its body in a séance and the messages the spirit obtains during its flight in the spiritual world, are to be delivered through the shaman's mouth. As for the "possession" type, spirits possess a shaman's body, descending from the spiritual world. In Siberia the "ecstasy" type was widely prevailing. The shamans found on the Japanese Archipelago including the Okinawan "yuta" and Ainu "tuskur," are exclusively of the "possession" type, whilst interestingly on the Korean Peninsula both types coexist. Needless to say, the itako of the Tohoku region is a Japanese representative of the "possession" type. The Slavic Research Center of Hokkaido University where I was a research fellow until this March, has been inviting every year distinguished foreign researchers to Sapporo for a long period with the aim to pursue joint research along with the Center's staff members. During the previous academic year a specialist of Siberian shamanism was selected for one of the foreign visiting fellows, i.e. Dr. Andrei Znamenski, associate professor of Alabama State University. Born in Samara in Central Russia, he obtained his PhD in the United States and got the present job at Alabama. Since then he has been publishing a number of books on shamanism, and therefore is now regarded as a promising cultural anthropologist. In Sapporo I became his host researcher. It was at the end of October that Andrei came to me and said: "I wish I could pay a visit to Osorezan and meet itakos there." 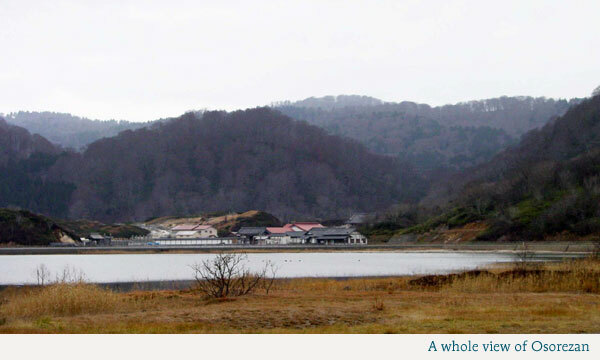 As the "Autumn Big Feast" at Osorezan had already been over, we missed the rare chance to see them therewith. Nevertheless, in a few days at the Sapporo station we took an express train bound for Hakodate, where we spent the night. On the following day early in the morning, via the Seikan tunnel, we arrived at the Aomori station. Having hired a car in Aomori, we started to drive northward to Osorezan. Reading the above, one may imagine that our trip should have been quite smooth. Unfortunately, it was not the case. At the car rental office we were ominously warned: "Osore-zan is closed, and even the approach thither might have probably been shut." We paid little heed to probable adversities as anthropologists do in a similar situation. Despite the warnings we both momentarily agreed to go ahead and set out for Osorezan, leaving behind the dumbfounded car rental people. 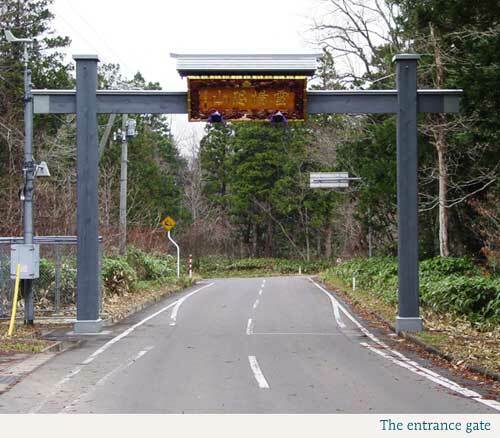 Fortunately the approach was not shut, though the sanctuary of Osorezan had been tightly sealed up and closed, as warned. Nobody was seen at the shrine office as well as in the precinct that we could glimpse through opening spaces in the gates and fences. Neither were there visitors or tourists. 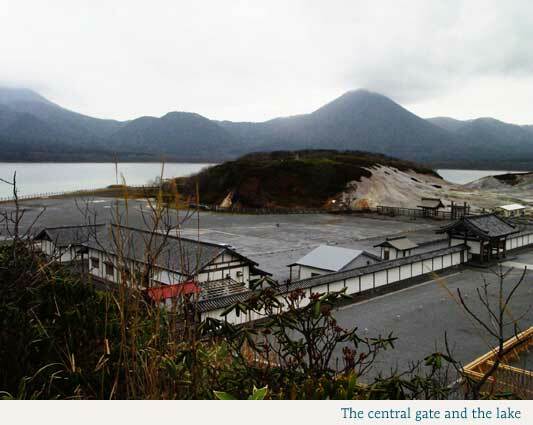 Nonetheless, we were able to imagine a fully crowded sanctuary when we saw a grandiose, yet empty, lakeside parking space stretching in front of the central gates. Having clambered up a precipice and reached a hilltop from where we could take a whole view of the sanctuary, we were attentively gazing, through anthropologists' eyes, at the shrine complex in the center, the cemeteries and gigantic wooden lodgings at the rear, and the ritual places blurred with sporadically ascending sulfurous white smoke where souls are to be invited down. Although we could somehow manage to pay a visit to Osorezan, it was extremely difficult to discover an itako who would agree to see us. I contacted nine active itakos whose phone numbers happened to become available, proposing each one to perform a "calling-spirit-down" ceremony for a Russian scholar who was very eager to talk with his passed-away grandfather. Most of the proposals were declined with various reasons being presented. A sole exception came from Ms. N who lived in a southern city of Aomori Prefecture. She simply said: "I am full of appointments, but if you like, you can call at my place tomorrow early in the morning." Her workplace turned out to be a modest house situated amidst similar houses in a residential area. We might have found it difficult to identify that house were there not a huge advertising board written "The Itako's House" attached to its outer wall. Having put on a short ceremonial robe as well as a robust necklace that was threaded with wild animals' canine teeth and back bone joints, Ms. N abruptly had us write "the person's" name and date of birth down on a large sheet of paper. This was all that she asked us for. All of a sudden, she began to murmur in a changed voice toward Andrei who was sitting behind her. I did translate her speech into Russian since it was rendered in Japanese. Her murmur that lasted for, insofar as I could remember, less than a quarter of an hour, was crowned with a warning to Andrei that he must be particularly careful about the coming days in March of the following year. After the ceremony we were invited to the dining room and served with green tea. Her talking about various topics that followed proved to be by far the more interesting for the anthropologists. She never demonstrated her displeasure even to our most impolite questions, invariably preserving a prudent smile inherent of the thoughtful elderly lady. Even a question was heard from her addressed to Andrei concerning the current political situation in Russia. We departed from her house thanking her, first of all, for the generosity she could afford to show us by having accepted obviously unusual clients like a foreigner and his interpreter. Notwithstanding frequent arguments on shamans that they are nothing but swindlers or psychopathologic patients, as far as Ms. N was concerned I did notice no signs thereof, and could not help but concluding that she was a sane person. It must be stressed herewith that her professional skill is acknowledged as such in the local community and hence she has been frequented by a great many clients. This situation reminds me of Mircea Eliade's clear-cut definition of shamanism as "archaic techniques." It may be quite probable that Ms. N could have tolerated, amongst others, not only the Japanese speech rendered by Andrei's grandfather but also my presence as his interpreter, simply because shamanism is nothing but "techniques." Meanwhile I am profoundly pleased that, for the time being, I have not yet heard of anything unusual that might have taken place around Andrei, despite the warned March days of 2004 having already elapsed.